Christmas: there really is no better time of year to embrace Scandi style decorating – it’s cold outside; the fire is going; mulled wine is on the stove and you can pretend for just a second you are actually living in that Norwegian cottage of your Pinterest dreams. So keep your dose of Hygge high with our Scandinavian Christmas decorating ideas. Take inspiration from this room by Neptune and pull out the (faux) pelts, pile up the chunky blankets and stack up the logs. The more texture the better we say. If there isn’t an abundance of Christmas candles dotted around, can you even call it Scandi? The White Company is of course smashing the Christmas candles this year, and while the classic Winter will always have a place in our hearts, we are also loving the comforting, earthy smell of Highland Escape. And since having constantly lit candles dotted around your house probably isn’t very realistic, recreate that cosy glow with plenty of artificial lights. Obviously fairy lights are a given at Christmas, but these LED candles from Lights4fun are also perfect for recreating candle light. Plus they are made from wax so have a very authentic look. As much as we love the smell of a real Christmas tree, this year we are really feeling the alternative Christmas tree. This simplistic white washed ladder has been decorated with an array of baubles from Marquis and Dawe and we love the understated (but of course still very festive) look. If you simply can’t live without a real tree, just keep decorating to a minimum. We aren’t dismissing your pink tinsel and techno coloured ornaments, but if you want all the Scandi vibes, leave those in the loft this Christmas. Check out Cox and Cox for their beautiful selection of Sandi style decs. We are talking wreaths, garlands and trees – as soon your house starts to resemble Narnia you are about halfway there. The Scandis are all about bringing the outside in, especially at this time of year. And if you can’t make it, fake it with our pick of the best artificial Christmas trees. Forget hanging stuff off the tree; in every Pinterest image of Scandi Christmas decorating ideas there is something beautiful hanging from the ceiling. If you are lucky enough to have beams in your house, try hanging decorations and bits of foliage from it to re-create this look. And if you can’t manage hanging a forest from your ceiling, try wrapping some evergreen around you headboard instead for a similar, more low maintenance effect. We'd go fake though – pine needles in your bed = ouch! In keeping with the whole minimal mantra, try sticking to a monochrome scheme this Christmas. Just balance out the black and white with various hues of grey and add in some wood accents or just bring in a few boughs of fir (or a John Lewis & Partners pine garland would do the trick). So far we have been all about the monochrome and the neutral but you could try out a more traditional Nordic look and introduce some colour (when we say colour we do basically mean red). 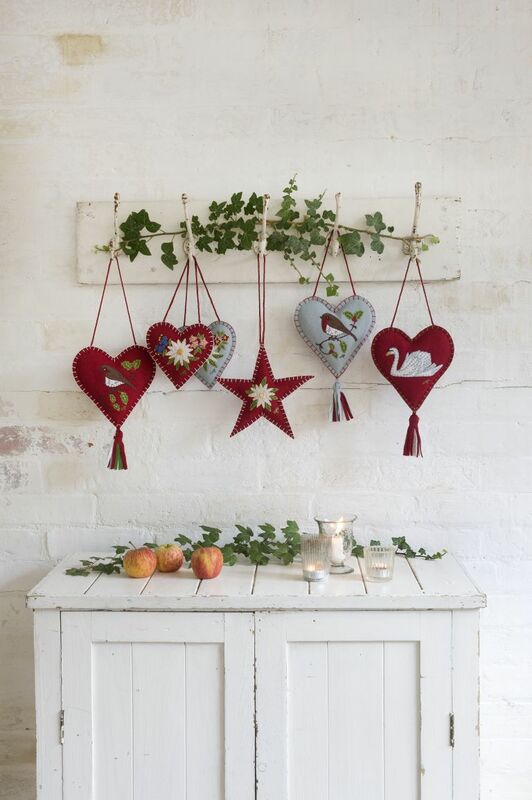 These gorgeous hand embroidered decorations are from Jan Constantine but Ikea are also great for more traditional decorations. String ivy over the tops of wardrobes, drape boughs of evergreen along a dresser, tie holly to kitchen shelves. As we have said many a time, Scandi Christmas decorating ideas are so much about making use of natural materials, so just adding a few touches of evergreen plus some fairy lights and a scattering of Christmas ornaments to bigger pieces of furniture will give your home a rustic, festive feel. Because, apparently that's a thing. But seriously, how dreamy is this Christmas tree skirt from Anthropologie? Yay, no more ugly metal stand interfering with your Scandi look! We know we have gone on a lot about bringing the outside in, but it really is such an effective, inexpensive way to make a space feel more festive. Try strewing your Christmas table with some branches, stems of eucalyptus and pine cones for an on-trend Nordic look. This contemporary 'Christmas tree' from Bloom & Wild is perfect for Scandi-interior fans. Perfectly simple, it pairs frosted branches with paper pom-pom baubles (both come in a super slim box that fits through your letter box). Plus we love that you can just pack it all away and reuse them year after year. Scandi Christmas decorating ideas don't have to all be about cool wintery tones and monochrome colour schemes. Try adding in some warmer colours – just something as simple as switching up your cushions and throws could add a load of cosy vibes to your living room. All these cushions are from H&M Home so they are a super affordable way to give your space a toasty makeover. Want more Christmas decorating inspiration?